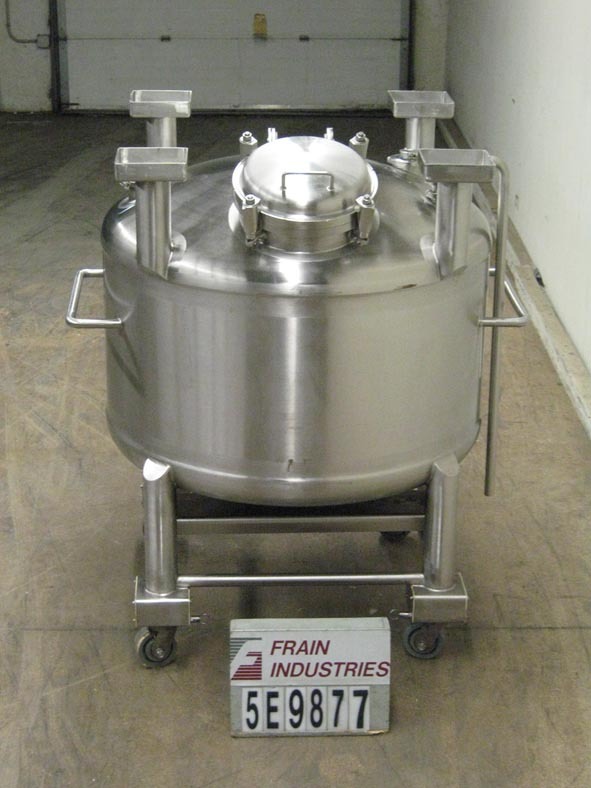 Single Wall Stainless Steel Tank – Frain Industries, Inc.
Tanks made of stainless steel are used to hold and store a variety of bulk substances. They are usually cylindrical, like drums, but their shape and orientation often varies-tanks are either horizontal or vertical and may hold anything from 1 gallon to millions of gallons. Stainless steel is chosen because of its corrosion resistance, which makes it useful for the storage of hazardous substances, resistance to high temperatures, and strength as well as the ease in which it can be manufactured and cleaned. Manufacturers of stainless steel tanks supply numerous industries where bulk material is handled, including agricultural, food processing, medical, and chemical management. They are commonly used where hygiene and corrosion are concerns. They are often used in the agricultural industry where they usually store animal feed and crops, in the pharmaceutical industry where they are used to store powders and chemicals, in the food industry storing bulk ingredients, and many other industries and applications. Stainless steel has good thermal conductivity and thermal expansion rate, which is key to tanks of any sort, and particularly useful in the case of pressure vessels. There are many different types of stainless tanks that differ in properties depending on their applications. SS tanks always contain openings called manways, where contents are poured or accessed. Stainless steel tanks are thin-walled constructions manufactured through a rolling process or welding. Although stainless steel is strong, it is vulnerable to buckling when the material is thin. Stainless steel tanks are most susceptible to damage during construction, transportation, and installation. The contents of full stainless steel tanks actually aid its stability. The shape of the tank is dependent on its diameter or height and the efficient use of material. Stainless steel tank manufacturers can make the ends of their products flat or in the shape of a dome or cone. In determining the size that a tank needs to be, consider how much extra volume should be included to cover for future process needs and also consider how the tank will be filled and discharged. The industrial applications where stainless steel tanks are utilized determine tank properties such as size, shape, and orientation. They are often vertical silos and horizontal or vertical storage tanks. Stainless steel is the material of choice for many industries because it is easily temperature controlled, cleaned, and sterilized. They must adhere to strict FDA, USDA and 3-A standards for health reasons. Tanks used to house foods are cleaned every time they are emptied and must maintain certain temperatures if they are holding perishable food items. Stainless Steel Tanks Stainless steel tanks are thin-walled constructions manufactured through a rolling process or welding. Although stainless steel is strong, it is vulnerable to buckling when the material is thin. Stainless steel tanks are most susceptible to damage during construction, transportation, and installation. The contents of full stainless steel tanks actually aid its stability.